July 2012 - Whiteboard Consulting Group Inc.
Terry was certainly a stubborn little dog, but when he knew exactly how things were going to go he was happier and well behaved. Is your team happier and more productive when they know what to do and achieve consistent results ? I bet they are! I don’t mean to say they should be doing one task over and over again. Imagine a common approach to problems, or a fool-proof process for expense reports. It’s dreamy! Some days that stubborn little dog of mine wouldn’t erm….go #2. I’d wait and wait and be late for a meeting or an appointment. So I had to develop a process. But first I needed to try all the available options. I tried taking him out as soon as I woke up, waiting until the last minute, before he ate, after he ate…you get the picture. Finally I got there. Wake up, eat, go out, circle the block, and 90% of the time I had success. But then there are always variables – rain, another dog visiting, his furry friends at the park that distracted him from his duties. So sometimes I made minor adjustments for those days – if the dog park looked busy I circled the other way, I took the dogs out seperately if we had a visiting dog. I had a process, but was willing to adjust as necessary. The key is, you need a process that meets your goals 80% of the time, and then you can adjust as needed for the other 20%. Why spend all of your time trying to plan for the 2% chance of rain? Process doesn’t need to be rigid – it can change with circumstances. When data starts telling you to change – DO IT! Do you sometimes feel that everything is an ad-hoc task? Do you try every possible option for a problem and never know if what you are doing is working? Sometimes a little process thinking can get you on your way, and it doesn’t have to be hard. Map out your process that happens 80% of the time. When a bump in the road pops up, try #1 then adjust. Go back to 1 and document your “new” variable process. Map, Adjust, Repeat. Don’t make a job out of it – use some sticky notes that you can move around every day until you get your process refined. Process is a process – give it a try. Make sure to follow us on Twitter @whiteboardcons to stay up to date on what we’re up to this week. Have thoughts or ideas? Use #betterfastercheaper to join the conversation! What we are trying to say is, don’t be overwhelmed by process design or process improvement. It doesn’t have to be fancy or showy – simple is definitely better in the process improvement world. Ah, we hear that a lot. And to that we say, in the nicest possible way: sure you do! EVERYTHING is a process. Grilling the perfect steak (season, marinate, sear, flip, grill, serve), getting ready for work in the morning (turn off alarm, shower, dress, breakfast, coffee, car), checking your eMail (sort, read, respond, file). Let’s look at that last one a little closer. Do you follow the four eMail steps mentioned above? Or, are you like most people in that eMail causes you untold anxiety every single day? Is your Inbox full of unread eMails? Do you try to keep up, but never quite get there, and then get more emails from people wondering why you haven’t responded? 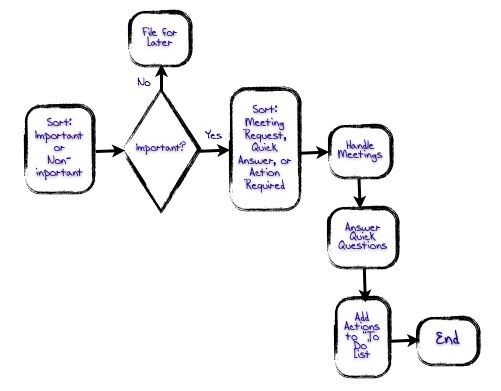 I hope you would get a pencil and a piece of paper and draw a really simple process map and really think about all the steps that you take to handle your Inbox. If you do it right, the problem would jump off the page at you! Easy peasy. That’s the difference between what we call a “Thought to Be” process map and an “As Is” process map. When you dig into it, the“As Is” really tells the story. In this example you’re wasting time and energy by handling each eMail one at a time, whether they are “info only”, “action required”, “urgent request”, or “meeting requests”. Now the problem jumps off the page – it’s actually a loop with no defined ending! Give it a shot and let us know how it works, would you? PS – Make sure to follow us on Twitter @whiteboardcons to stay up to date on what we’re up to this week. Have thoughts or ideas? Use #betterfastercheaper to join the conversation! You may remember the word “osmosis” from high school science (things tend to flow from areas of high concentration to areas of low concentration), or you may have learned it in Psychology 101 as “the unconscious assimilation of ideas”. Today I want to show you how you can apply the word osmosis to the creation of a Process-Driven Culture. Are you a change agent? Are you a process improvement nut? Are you lucky enough to be both? If yes, I bet you have a permanent bump on your head because you feel like you bang your head into a brick wall all day long. You have some great ideas that would make your organization better, faster, and/or cheaper, and you’ve even proven that those ideas work. You have the experience and the data. There is an excellent business case for doing what you suggest and industry best practices show that your idea is working elsewhere. So why won’t your boss/staff/peers make the changes you suggest? Why won’t they apply simple process improvement tools or go to a conference on business process design? It comes down to science really. Back to high school science: remember learning about inertia from Newton’s laws? “An object at rest (or in motion) will remain at rest (or in motion) unless acted upon by an unbalanced force.” It’s the same with people – all people will resist changes in their current state unless they are given a darn good reason not to. Many of you are probably familiar with the term “coaching” as it refers to employees. A good manager “coaches” their staff members to do the best job they can do via conversation, open-ended-questions, and leading by example. Cy Charney, author of Just-in-Time Management, says that “Coaching is a process that will let your employees know that what they do and who they are matters to you. Good coaches train their people to do the job right every time.” I would add to that by saying that good coaching involves coaching up and across, as well as down! Teach your boss, your peers, and your employees to Define It! Map It! Prove It! without them knowing they are being taught! By using good coaching techniques you can engage people in conversation and get them to start really thinking about problems they are trying to solve, using process improvement tools, and looking for data to prove that what they are proposing will work. Have a flip chart (or a Whiteboard!) in your office. Ask people to draw their ideas. Slowly steer them in the direction of a process map with swimlanes. Start requiring that kind of diagram on a regular basis. Ask people for numbers to back up their issues and concerns. Lead them to develop clearly defined problem statements. Start to help people to continually frame their statements in a data-driven manner, and do the same yourself. Essentially, people will learn by osmosis. By introducing concepts via coaching, you are making the concept of a process-driven organization and data-based decision-making commonplace. People won’t realize they are following a specific methodology, just as they don’t realize they are using algebra when they analyze numbers. They assimilate to the new culture you have created. And then, when they are ready, you can start introducing formal programs. Hey – if you do it right, they will think it was their idea. Make sure to follow us on Twitter @whiteboardcons to stay up to date on what we’re up to this week. Have thoughts or ideas? Use#betterfastercheaper to join the conversation! Becoming an Entrepreneur: Secrets from the Crypt. Starting a business is super risky, and I’ll be the first to say that it takes a great deal of hard work. There are some tips and tricks, however, that can help make your life easier from the start though. Today, I’m going to tell you a trick that helped us. Am I normal? I wake up scared every single day! Do you worry about what sales tactics you are going to use? Do you stress about product delivery schedules? Have you struggled to find out your target market? Are you so busy operating your business you haven’t thought about strategy or planning? A quick tool and a little bit of thinking can get you ahead of your competitors, and let you focus on running your business – Better. Faster. Cheaper. Entrepreneurial Strategy in 15 minutes! Before Ruth and I started WBC we brought every Post-It Note and marker we could find and we covered the walls with our ideas and then organized them. This type of activity may seem “lame” or corporate. But it gives your organization direction. Our mission is to _______ (what you do) for ______ (who are your target customers) with our _________ (unique service/product) in order to ________ (achieve a result *hint: use data). Why are you starting this business? What kind of product do you want to offer? What kind of values do you want to embrace? What kinds of customers do we want? How would they describe us? What kind of experience will our customers have when they interact with us? Brainstorm and then prioritize them. It’s really that simple! The next step is to communicate this mission statement to your team, your staff, and your customers so they know what you stand for. A good strong collective strategy works better than one that no one knows about. Or one that is all things to all people. Make your business go from scary idea to reality. And that’s the first big step to being your own boss! If you like this article, share it on Twitter here.